I was beyond excited when this book came in the mail this week. Even better? A snow storm arrived at the same time. What's a girl to do when snowed in with a great book? Lose herself in it:) Here's a short blurb, and we'll chat on the other side. This story took off at a great pace with Emma's boat sinking and her near drowning. I immediately loved the relationship between her and her brother. When they are rescued and brought to town, Emma's plight continued. Young and single, always desiring a home of her own, it made sense for her to marry Patrick. Still, I did struggle with how quickly the thought was introduced to the two and how they both went through with it. That struggle was a very minor blip on my enjoyment of this book. Patrick was so incredibly sweet and true, and yet possessed such strength. I loved seeing the theme of forgiveness woven through his story and his never-failing integrity. Each decision he made was true to his character and made sense with the outside circumstances, even if it didn't immediately seem to. Hedlund made sure to tie up all the threads. As for Emma, her journey of finding a home drove all she did. She's loyal and loving, and though she makes mistakes, she learns. Her biggest lesson? Home is found with God. She and Patrick were a pair I won't soon forget. All together I thoroughly enjoyed this book, but I shouldn't be surprised. Jody Hedlund has a way of weaving a tale that always pulls you in. She never delivers needless angst, but rather let's the plot develop in an authentic way. And she's great at romance. Like amazing. 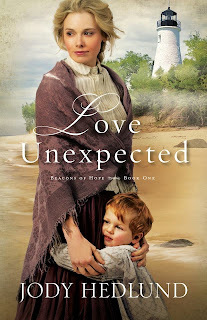 I happily give Love Unexpected 5 out of 5 stars. If you'd like to purchase it, you can here. After all that shopping next week, you'll want to curl up and relax with this wonderful book! Since then she’s gone on to publish numerous best-selling and award-winning books. 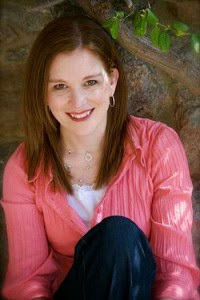 You can learn more about Jody at her website, here. I've always been intrigued by lighthouses. I've visited some on the East Coast and even collect lighthouses. So the first thing on the cover that caught my eye was the lighthouse. Then I noticed the child's face. What a beautiful child, and the heroine is also beautiful. Jody must be so pleased with the amazing cover of her book. I hope bookstores display it so customers see the front first. They'll be sure to pick it up. It sounds like a great story and one I'm sure I'd enjoy reading. Susan, thanks for sharing!